NCR (no carbon required) or carbonless books have eliminated the need for carbon paper between sheets to create multiple copies of the same page. The back of the top sheet of paper is chemically treated to transfer the pen pressure from the first page to the subsequent pages. The bottom side of carbonless NCR paper is coated with micro-encapsulated dye that breaks when pressed. The top of the second sheet is coated with clay that reacts with the dye to form a permanent mark. When the top sheet is written on, the pressure causes the micro-capsules to break and release the dye. 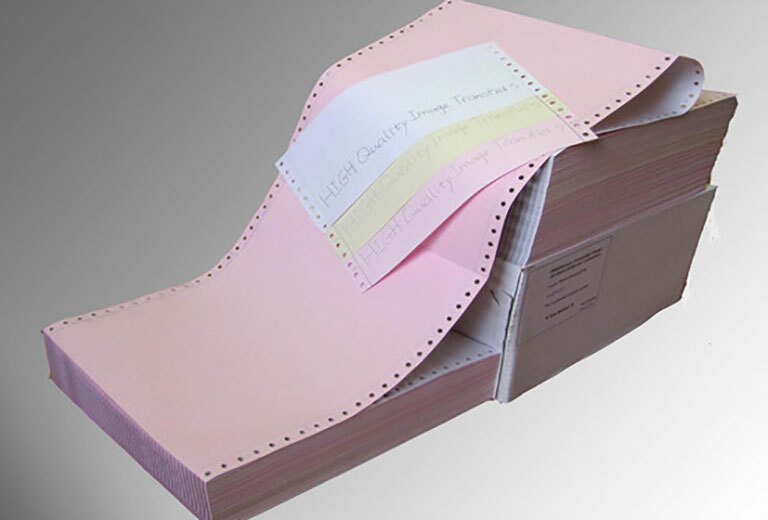 NCR books are usually used for Job Cards, Order Books, Tax Invoice Books, Delivery Books etc. The common sizes for NCR books are A5 (148x210mm) or A4 (210x297mm) portrait or landscape. The client must specify What page colours they want and if the book is duplicate, triplicate or 4 part. The client have options to number and perforate the book. Duplicates - 100 Sets per book. Triplicate - 50 Sets per book. 4 part - 25 Sets per book. Continuous forms are multi-parts ‘sets’, that are fed through a dot matrix printer. Each ‘set’ of the form, could be 1, 2, 3 or 4 pages that are crimped together and, using the familiar perforated strip down each side, are then fed through your dot matrix printer. 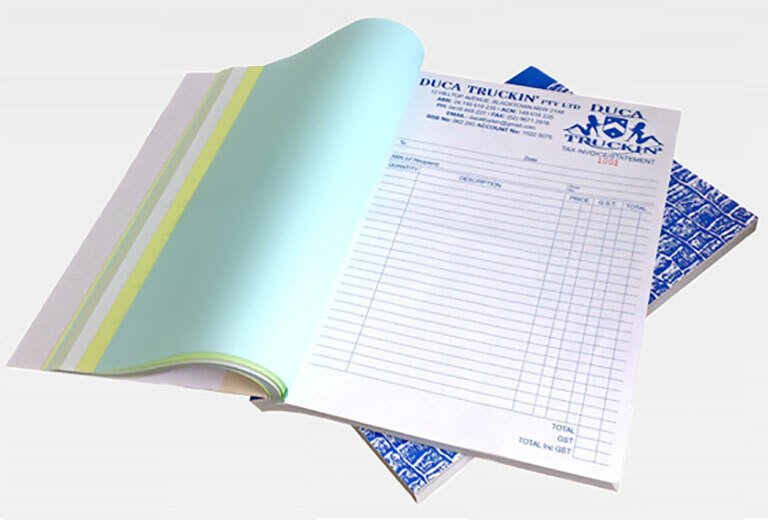 These type of NCR sheets are most commonly used for Statement, Invoices, Waybills etc. The client needs to specify how many parts (duplications) they want and what colour pages they require. Client needs to know that size will feed through their machine and supply the measurements in millimetres. Please supply the artwork in the colours that you require it to be printed in. Client needs to specify where they would like to have the perforated line, artwork needs to start 20mm away from the side they would like to have perf’d. Please supply artwork in pdf format. Alternatively we can quote on layout and design. The client needs to be clear as to what files he/she has in order for us to quote accurately.